You may have heard those odd names for big bottles of wine such as Magnum, Jeroboam, Rehoboam, and Methuselah. What do they mean and where do they come from? How long does wine have to age for it to be called a Methuselah? I'm glad to be able to report that the age of the wine has no connection with these curious names, otherwise a methuselah would have age for 969 years. Those crazy names refer to the sizes of the bottle, but it's now illegal to put any of them except one on a bottle and they've become curiosities that mainly come up in pub quizzes. The only term of the set that's still allowed is "magnum", which refers to a bottle containing two standard bottles or 1.5 litres. It's also the oldest of all the terms, having appeared in English in one of the prose works of the Scots poet Robert Burns, back in 1788. It's an abbreviation of Latin "magnum bonum", a large good thing. It was in Scotland that it acquired the sense of a size of wine bottle and became abbreviated to "magnum". It has also been given to a variety of potato, various varieties of cooking plums, a gun, and even a large-barrelled steel pen. The remainder of the set, as usually quoted in reference books, are jeroboam (4 bottles/3 litres), rehoboam (6/4.5), methuselah (8/6), salmanazar (12/9), balthazar (16/12), nebuchadnezzar (20/15), melchior (24/18), solomon (28/21), sovereign (33.3/25), and primat (36/27). 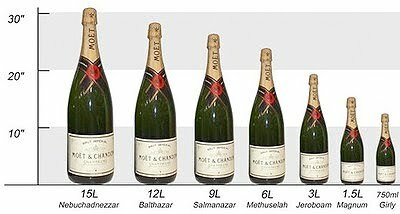 Some lists even include a melchizedek, holding 40 standard bottles or 30 litres. Posted by Steven Moore at 9:18 a.m. I would appreciate if someone here at communicationscoach.blogspot.com could repost it. October 21, 2010 at 3:39 p.m.
December 10, 2012 at 4:57 p.m.
Dan’s e-mail handle originating from a distinct location and also this time frame I didnt have an problem concept. got currently directed the application in your enterprise email, please I want your own critical reply. January 7, 2013 at 10:36 p.m.
Wow! Thanks a lot! It's my job to wanted to publish on my small blog as well. May i have a fragment of your post for you to my site? January 22, 2013 at 11:07 p.m. Fantastic document plus right to the point. I don't know if this sounds like the truth is the absolute right place to inquire about nonetheless would you everyone has any kind of just what it where we can get some freelance writers? Thanks a lot before hand. February 11, 2013 at 3:16 p.m.
June 14, 2013 at 9:56 a.m.
July 12, 2015 at 12:15 p.m.
October 5, 2016 at 10:16 a.m.
October 5, 2017 at 2:12 p.m.
November 9, 2017 at 2:43 a.m.
January 22, 2018 at 11:33 p.m.
January 23, 2018 at 11:15 p.m.
February 23, 2018 at 2:14 a.m.
April 16, 2018 at 1:54 a.m.
July 4, 2018 at 3:36 a.m.
September 17, 2018 at 4:33 a.m.